I am building a frame fixture using 8020 and some simple machined parts. This is based on my learnings from the simpler one that I built, plus inspiration from photos of the Arctos Jig. * Cheaper than a used Nortac or similar jig. It looks like my total cost will be about $300 and ~20 hours of machine time. * Not annoying to use, but also not designed to be very quick to dial in like most professional jigs. 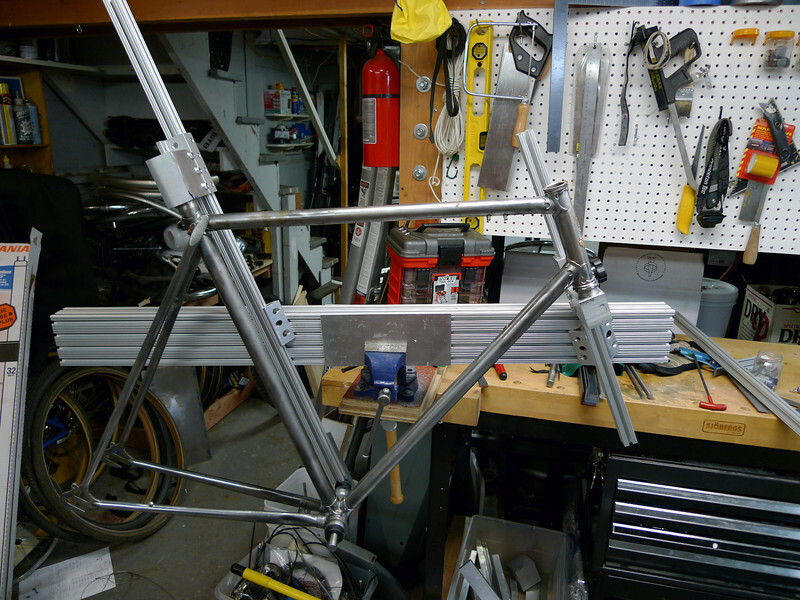 I have no plans to become a professional framebuilder and don't mind spending 30-45 minutes setting up a jig. * My first jig was too adjustable, which made it easy to get things off of the centerline. On this one I fixed the centerline at 2.5" and am machining parts accurately so that I don't need to make them adjustable. I'm highly influenced by the Arctos jig since that had a lot of design similarities (with much nicer execution) to my first jig. The rear triangle dummy axle is going to be a complete ripoff of the Arctos since I never came up with a design that I liked before. The Arctos is much slicker when it comes to setting angles. Current jig progress. Front triangle is mostly done. * Tube holders on the diagonal supports. Hi Alex - I've been following your projects for a while; we seem to be following a similar path. I recently put together a similar frame jig, but it has one major difference. I arranged the HT and ST supports perpendicular to the main beam. It simplifies setup and gets the rear dropouts up to the level of the beam, making it easier to build the support. http://www.flickr.com/photos/jerryw62/3208296429/ -with a partial frame I'm working on(fork mounted temporarily to take some measurements). There are a few other random pics of it in my photostream as well. I'm not sure this will be a help to you, but I thought I'd throw it out there anyway.